PLOT: Based on Robert Kirkman’s comic book series, you play as Lee Everett, a professor and convicted murderer who was about to serve a life sentence when the zombie apocalypse took hold. 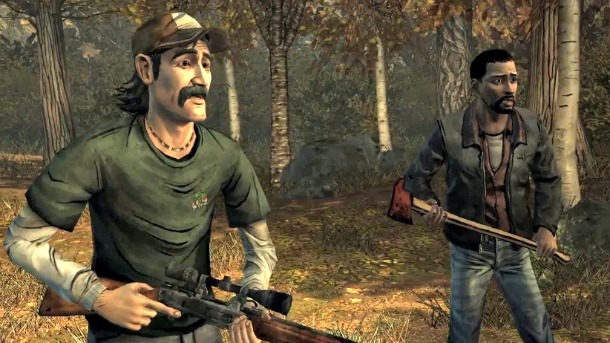 When Lee encounters a little girl by the name of Clementine he must use all his skills to keep her safe. The Walking dead isn’t a new game by any stretch. Originally released three and a half years ago for PC, Mac. PS4 and Xbox 360 the episodic adventure has never been out of the press ever since due to some clever ports (including mobile platforms and next-gen consoles), a GOTY compilation and now the inclusion of the full 1st season in Microsoft’s Games With Gold scheme. In fact it is only because of this free offering for Xbox Live subscribers that finally got me to take notice as I had grown weary of game (and film) developers obsession with zombies quite some time ago. I have been pretty vocal about my dislike of episodic titles in the past, fearing that they are simply lite games released with a mid price that offer little value, so coupled with the zombie theme I wasn’t expecting too much (although the GOTY edition meant that I got the full game plus and addition ‘special’ episode). After a full play through of the game and having eagerly looked at other similar games, it seems I was just resisting change for old times sake and not realising the benefits of a model that forces a developer to engage their audience or risk them not reinvesting in later episodes. The Walking Dead is based on the same comic/graphic novels as the AMC TV series, but whilst it stays in Georgia USA, ifollows the stories of brand new characters. For all five of the standard episodes (though not the special ‘400 days’ episode) you control Lee, an ex college professor who is being transferred to state prison following his conviction for murder when the apocalypse hits and his police transport crashes, forcing him to escape and fend for himself in a new and harsh world. 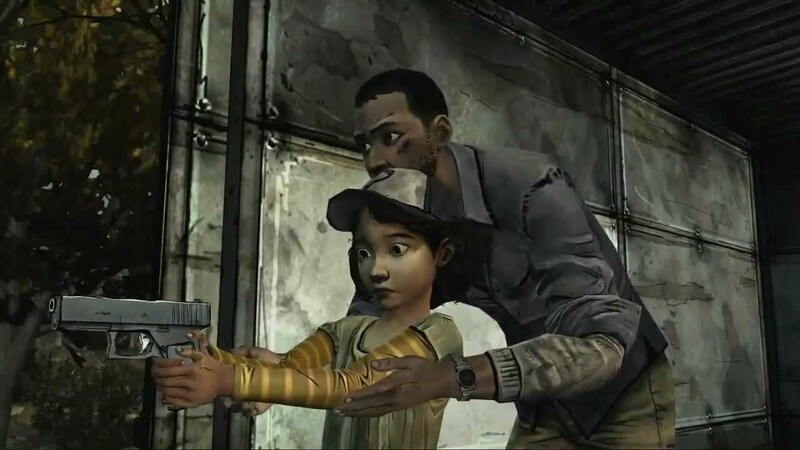 Early on in the first episode Lee meets Clementine, an eight year old girl who is all alone after her babysitter is killed whilst her parents are away. From that moment on Lee must become a father figure to the young girl, protecting from and preparing for the horrors of the new world. With a very comic book graphic style, Telltale Games have done a fantastic job of recreating a hand drawn world with pathos, fear, sorrow, hope and adventure. The majority of the game is played out through investigation, interacting with objects and dialogue between the various characters met along Lee’s journey. There are small pockets of action included where you must fight zombies with all manner of weapons, guns, or limbs, but it would be remiss to give anyone the impression that this game has any claim on the action genres. The Walking Dead is one of the most thoughtful games I have played in quite some time, which is strangely juxtaposed with the quick time events and snap decisions that must be made. Each episode contains three distinct decision points and it is clear that the branching of the story is the dynamic that keeps you focussed, knowing that if you lose concentration then your decisions could lead to a very different outcome. Of course the main story continues regardless of these forks, but the choices you make will affect how other characters react to you and can even decide if they live or die. It is hard to discuss the episodes themselves without spoilers and it would be a real shame to ruin the amazing story and some of he deeply emotional scenes. I was moved on more than one occasion and have real hope that the interactive fiction game is far from dead. I also have a new respect for episodic games having seen how the introduction of episode ending cliff-hangers can keep you interested where a standard release may be moving into it’s drudgery middle period. The best recommendation for any game is if you immediately rush out to find more by the same developer. Since completing The Walking Dead Season One I have already picked up their Back to the Future adventure game and am excited to try The Wolf Amongst Us and the Borderland Tales. Telltale Games have done a fantastic job of recreating a hand drawn world with pathos, fear, sorrow, hope and adventure. 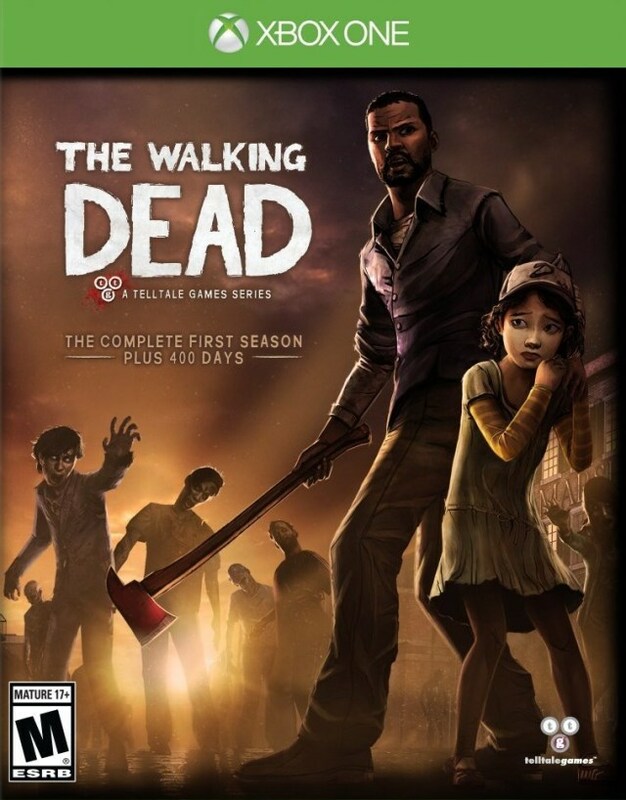 If you prefer your games to lead with a strong story rather than blazing guns then you can do much worse than TWD and if you are an Xbox Live Gold member the game is free until 15th November 2015.